"In Revolutionary times, spies sent secret messages in clever ways. In this true story, John Darragh, a teenaged spy from a Quaker family, carries a message to General Washington sewn inside his coat buttons. Narrator Jason Harris conveys how much is at stake (spies could be hung), creating a healthy dose of dramatic tension over John's loss of a button and his capture in the woods. 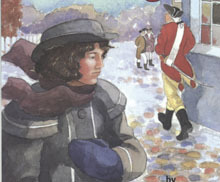 Young historians will appreciate the accompanying book's simple but evocative watercolor illustrations and the production's background music, including the fifes and drums of a revolutionary band. They'll enjoy the story's plentiful dialogue as gruff soldiers, family members, and even General Washington himself make this story vivid for young history buffs."